, Bhubaneswar on 20 August 2017, Sunday. The speakers for the first session of the event were Mr. Sarabindu Mohanta (Product Head, Indian Oil), Mr. Partha Deb (Power Economist, GE Power), Mr Harish Raghu (Managing Director, SaGgraha Management Services Pvt. Ltd.) and Mr. Benjamin Mathew (Head of Strategy, MART). 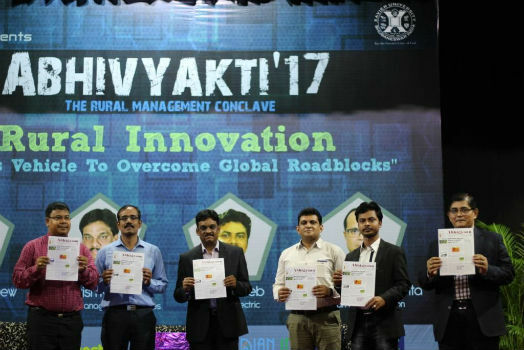 The topic of discussion for the conclave was “Rural Innovation – India’s vehicle to overcome Global Roadblock”. Dean of Xavier School of Rural Management, Prof. Kajri Mishra inaugurated the conclave. Prof. T. Kumar, moderator of the discussion opened the forum by stressing on the macro perspective of Rural Innovation. The first speaker of the session was Mr. Sarabindu Mohanta. He talked about innovation and the importance of its marketing. He also stressed on the importance of bridging the gap between rural and urban market and highlighted on how to bring about a change in rural economy and the challenges we face while doing so. The second speaker of the event, Mr Partha Deb put forth a powerful statement about how urban and rural development in India are like two sides of a coin. “Power Villages, Empower Villagers” he quoted, highlighting the fact that a major pillar of rural development is electrification of rural areas. The third speaker of the day, Mr. Harish Raghu explained about different types of innovation in rural areas and the significance of innovation in agriculture and micro finance. He also explained how financial inclusion mechanism is one of the key aspects of rural innovation. The last speaker of the day, Mr Benjamin Mathew went back to the basics of innovation and said, “First part of Innovation is how to comprehend the problem”. He highlighted on the current challenges we face in water market. He also talked about the intrinsic barriers we face while deciphering the solution for water problems and an operational model made for providing affordable drinking water among rural areas. Both sessions were followed by an interactive question and answer session with the audience. The event concluded with a vote of thanks by the coordinator of RMAX, Mr. Deepak Kumar Mishra. This event also marked the release of “Abhigyaan” a bi monthly newsletter by RMAX. RMAX is a functional student committee of XUB, which provides a platform for practical learning and exposure to the rural management education.